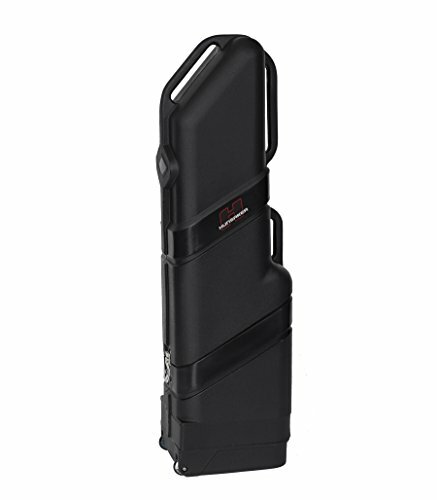 PATENTED DESIGN - The Ultimate Golf Travel Case for Protection, Security & Portability. ROTOMOLDED CONSTRUCTION - Made in USA and made from indestructible High Impact material, making it very tough inside and out. 3 GRIPPING HANDLES - Designed with 3 Strategically Placed Gripping Handles that are Molded-In for optimum handling, storing and transporting. PATENTED PERFORMANCE LATCHES - 2 Military Grade Steel Performance Latches. TSA approved Lockable PRO-Latch System. Each Lock has a special locking feature that keeps the case locked and can with or without a TSA padlock. Guaranteed Security and Never Fail locking system! TSA APPROVED - Airline Approved and accepts all types of padlocks. DURABLE IN-LINE RUBBER WHEELS - Extremely smooth, non-scuffing, quiet rolling in-line rubber wheels. HUNSAKER EXCLUSIVE BALANCE DESIGN - Equal weight distribution technology that equals out the weight of the case when having to lift the case. HUNSAKER USA - Lifetime Warranty! Patented Design & Made in USA! Roto-Molded Construction / makes it Armored and able to withstand punishment from travel and airlines. 3 Strategically Placed Gripping Handles. For easy pushing, pulling and carrying. Inline Smooth Rolling Rubber Wheels / Inside Dimensions: 50.00" x 14.00" x 11.50"
If you have any questions about this product by HUNSAKER USA, contact us by completing and submitting the form below. If you are looking for a specif part number, please include it with your message.